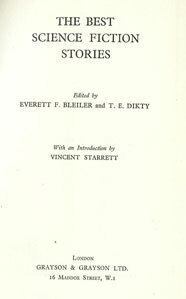 UK edition, with fewer stories than the original US publication (The Best Science Fiction Stories 1950). Robert Spencer Carr. Easter Eggs. William H. Shiras. Opening Doors. Murray Leinster. The Life-Work of Professor Muntz. Robert Moore Williams. Refuge for Tonight. Stephen Baxter. Traces. Voyager, 1998.